The 2010 tax season is officially over. What a relief! I have worked on the returned on and off the past couple of months until I mailed out the forms, together with payment checks, on April 14th. To me, it just means that, hopefully, I don’t have to think about it again until this time next year. It’s not that I couldn’t work faster. With no refund to expect, there’s no incentive for me to get it done earlier. However, if you do expect a refund, then you probably want to know when you will get your money back, if you haven’t received it already (hope you filed your return long before the April 15th deadline) . If that’s the case, there is a very easy way to check the status of your refund online. 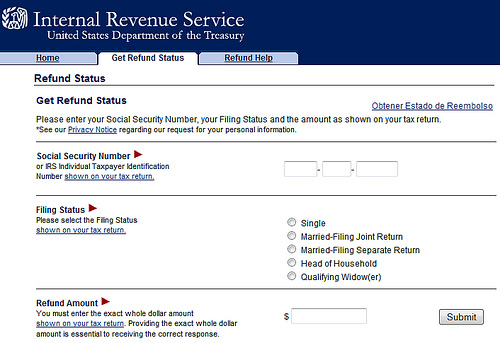 All you need to do is go to an IRS website, called Where’s My Refund and provide some personal information.